One of the best things that mountaineering has to offer is often the reward that comes after it. The outdoor community calls these rewards “side trips,” and sometimes, they are even more anticipated than the main adventure itself! For Team Sweetie, we always strive to insert side trips during our climbs. After all, we deserve to reward ourselves after all the preparation, exhaustion, and risk in climbing treacherous mountains, right? As a prize for our spectacular Mt. 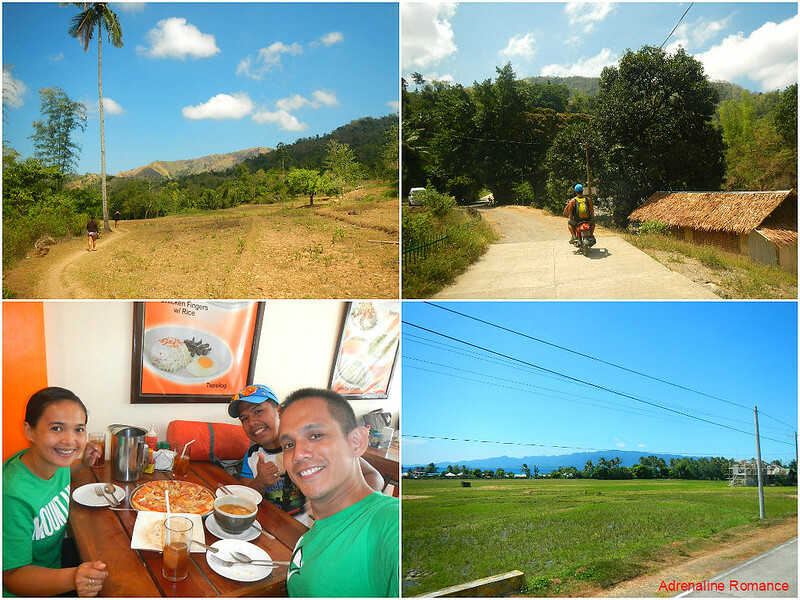 Guiting-guiting adventure, we opted to indulge in a few cool adventures in the pastoral municipality of Tibiao, Antique, which is a hundred kilometers from Kalibo. For us, leaving Sibuyan Island was somewhat a painful goodbye. Sir Remy and the local guides have been very good to us, not to mention the Good Samaritans who took us into their care. Mt. Guiting-guiting blessed us with beautiful weather, magnificent vistas, exciting adventures, and life-changing lessons. 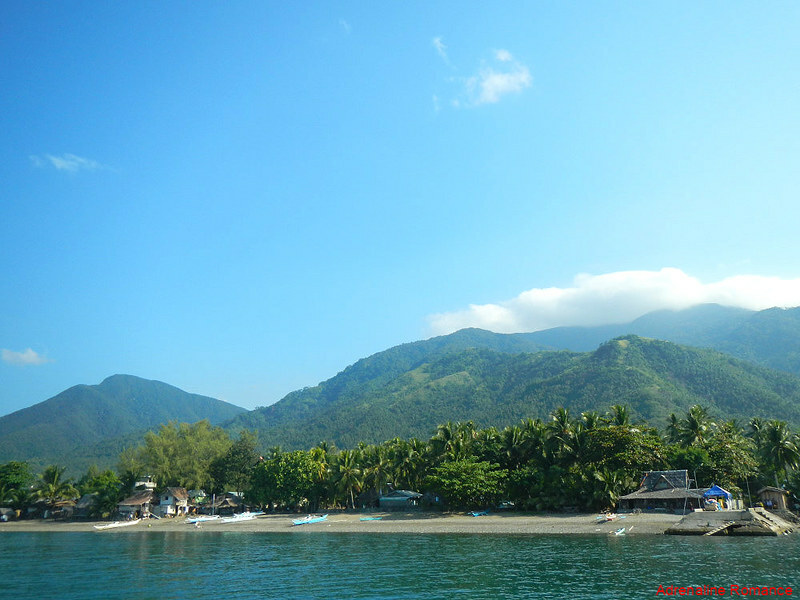 Yes, we will visit Sibuyan Island again although it would probably take some time for us to set foot in this isolated paradise. 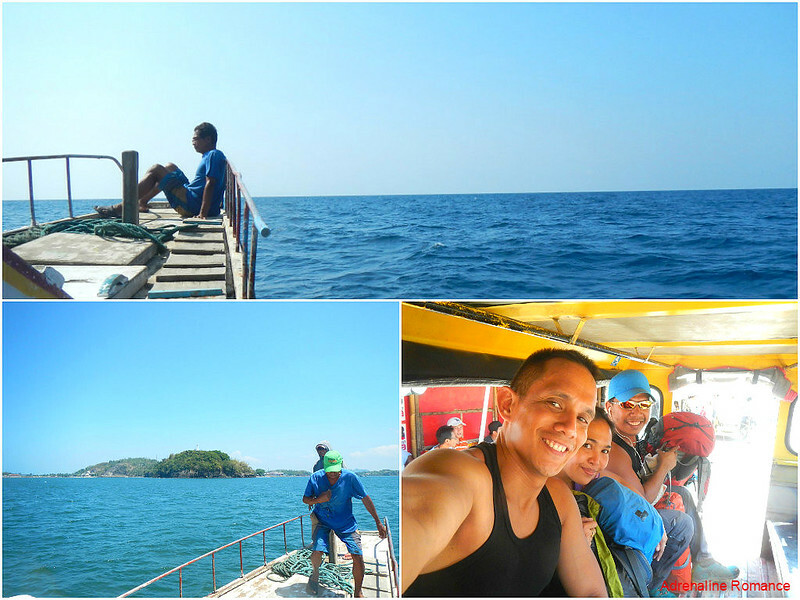 Because we were riding along with the waves, our boat trip across the Sibuyan Sea was fast and relatively smooth. We arrived safely at Culasi Port in Roxas City, ate a hot lunch in a local carenderia, and had a series of rides that took us back to the Kalibo Ceres bus terminal. From there, we took a bus to Culasi, a third-class municipality in the idyllic province of Antique. We rode across peaceful towns, vast farms, and scenic mountain ranges. It took us around 3 hours to reach the town center of Culasi. It was already 7 PM by the time we reached the town center. We headed directly to the tourism office, which was busy handling a group of climbers who plan to ascent the nearby Mt. Madjaas and monitoring a religious procession. The kind tourism officials provided us with important information and helped us secure lodgings for the night. We were all exhausted, and our legs were terribly sore that we could hardly climb the short flight of stairs leading to our room! Nevertheless, we enjoyed a delicious dinner and spent the rest of the night showering in hot water, slopping on liniments, and massaging our cramped thighs. We had a relaxing and dreamless sleep, our first real rest on clean sheets after several days in the wilderness. 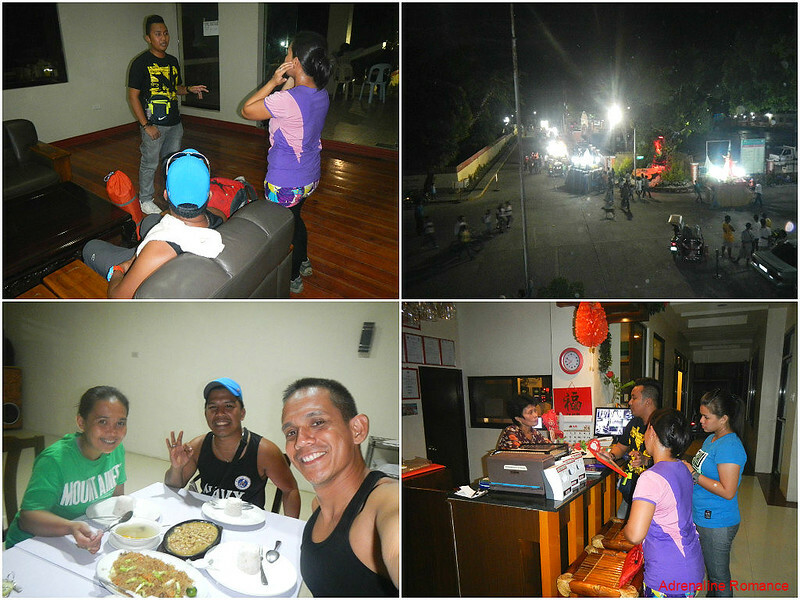 Thus, we were refreshed and excited to reward ourselves with a nice side trip to the neighboring municipality of Tibiao. 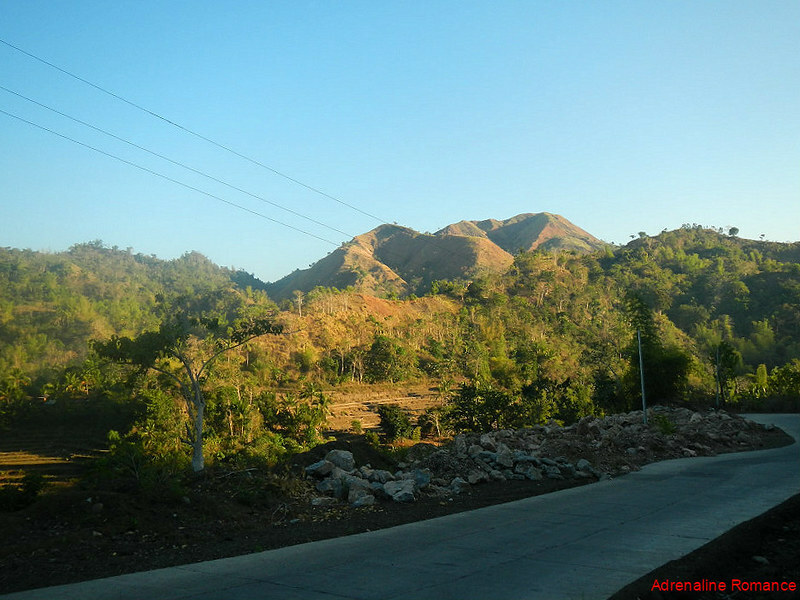 We took an early morning van ride and a habal-habal trip up the mountains of Tibiao. Since this is a popular tourist spot, we had to stop by the local tourism office and register ourselves. Stunning morning scenery, isn’t it? 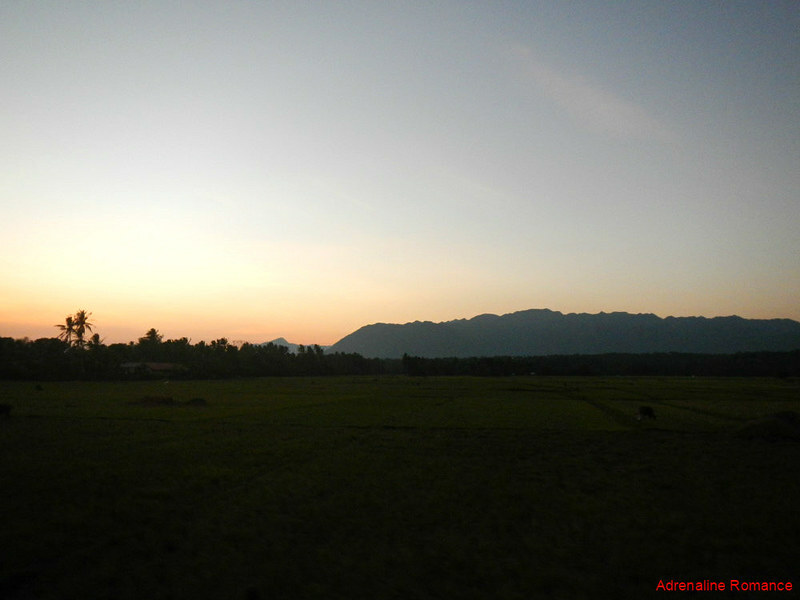 The vast grasslands and lightly wooded mountains reminded us of our memorable trip in Zambales. Soon, we arrived at the community of Tuno, which is well known for their rustic restaurants, river adventures, beautiful gardens, and something special, which we will show you in a little while. First, though, we need to have a simple but filling breakfast as we were ravenously hungry. After warming our insides with hot tocino, fried eggs, and piping-hot coffee, it was time to warm the outside of our bodies. 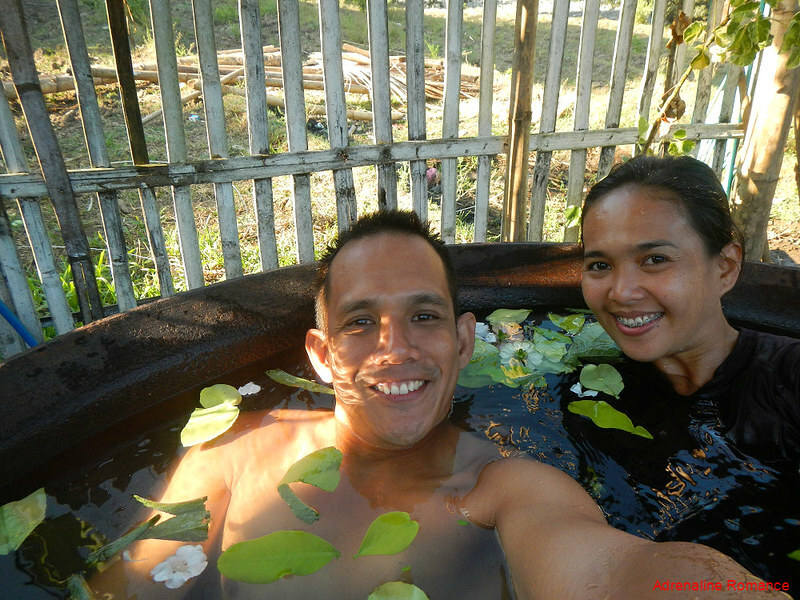 Behold the kawa hot bath, a very unique and relaxing activity in this part of Tibiao. It involves you being boiled alive (a little bit literally) in a large wok. Yes, you’ll never look tinola the same way again! 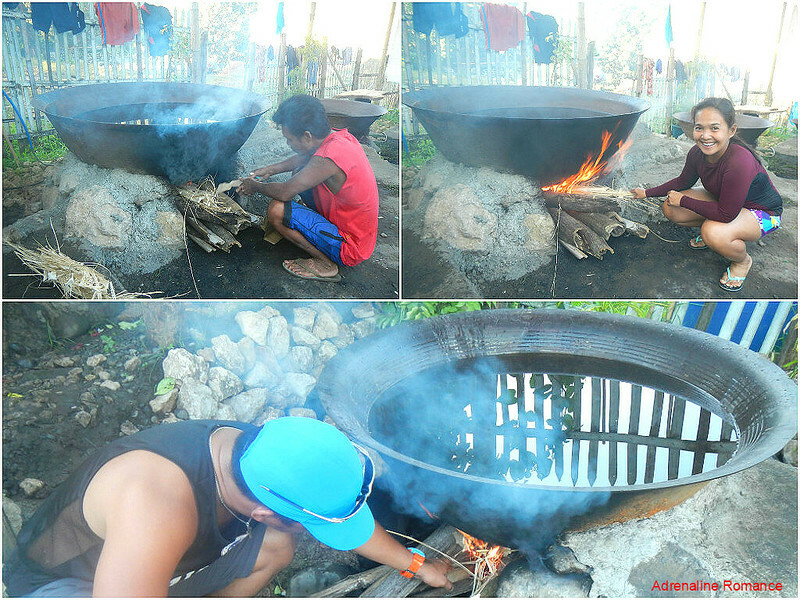 The establishment where we ate our breakfast have kawas, so the personnel lit up the fires. Rather than gas or electric power, pieces of wood and dried bamboo are used as fuel; yes, it’s the traditional way. Sweetie and Halourd wanted something “nostalgic” and “meaningful,” so they demanded that they make their own fires to prepare the vessels that will cook them. 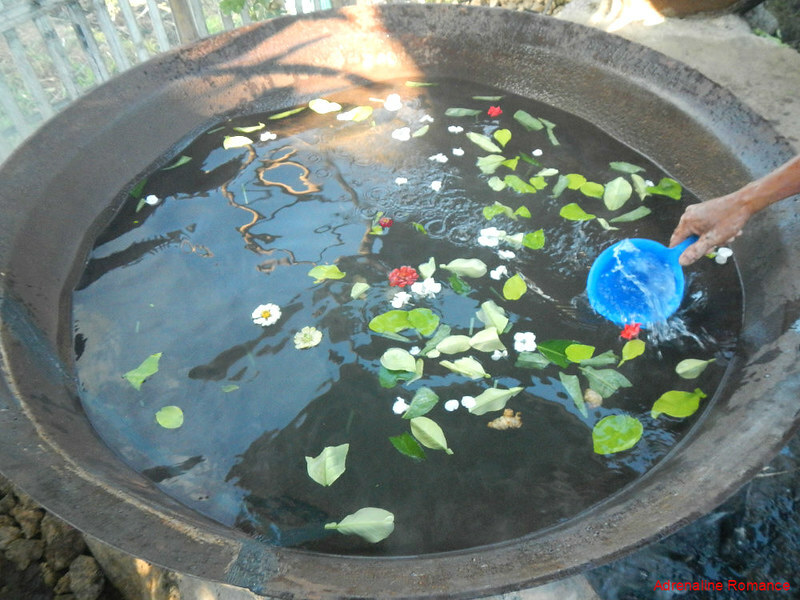 After the water is warmed up to a sufficiently high temperature, fragrant leaves, flowers, and herbs are added. When the water steams, the garnish gives off a wonderful citrus scent. We can hardly wait! We entered the hot water slowly to give our bodies time to get used to the high temperature. But once we were fully immersed, we simply reveled in the water’s warm touch. The fragrant, steaming water was absolutely and deliciously soothing; it felt so good and was a real treatment for our sore muscles and creaking joints. The large kawas used in the hot baths were once vessels that are used to process molasses. As more advanced methods of refining sugar became available, the kawas became obsolete. But creative and enterprising locals found another use for them by utilizing them as hot tubs. 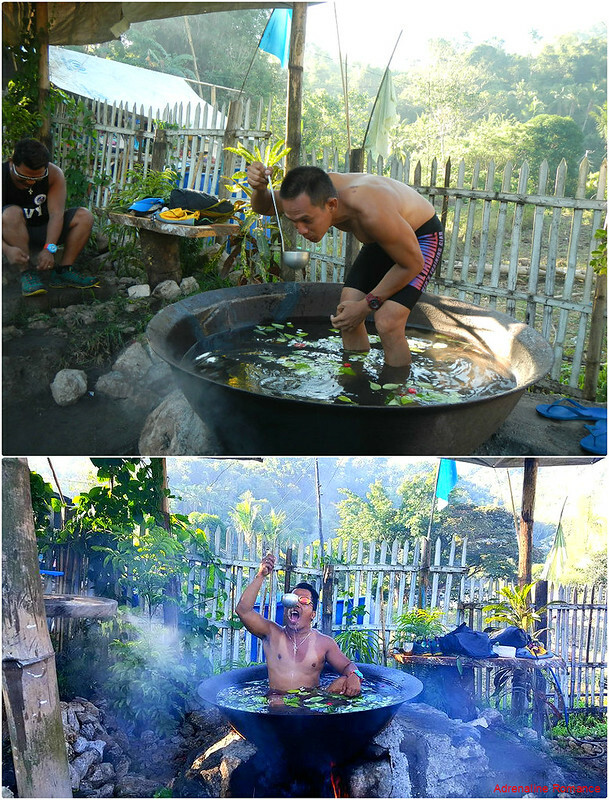 The re-energizing hot water, the beautiful countryside scenery, and the aromatic steam coming from the kawa made us feel as if we died and went to heaven. 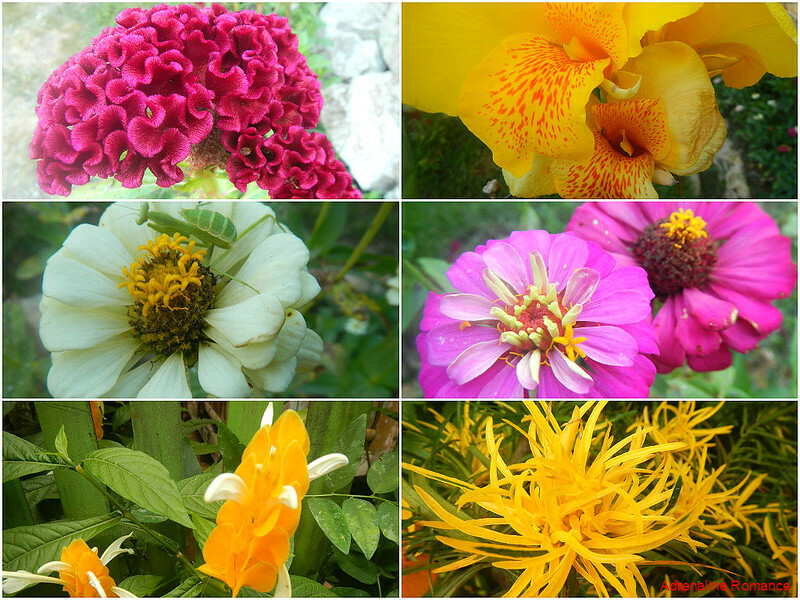 Our kawas were facing a nice flower garden. Check out these lovely blossoms. We wonder if they can survive in the lowlands where the soil is much more acidic. Have you ever tasted yourself? With the kawa hot baths, you will have the chance to taste your oils, salts, and other things too disgusting for publishing. Add in some garlic, onions, pepper, and ginger for a better flavor. Hahaha! Hmmm…you guys are still somewhat raw. Let’s light up the fire to cook you right. Hahaha! Sweetie and Halourd asked the owner to light up their kawas because the water was becoming lukewarm. After spending more than an hour snoozing in the hot kawas, we decided to close our pores and cool off at the nearby waterfalls in the area. 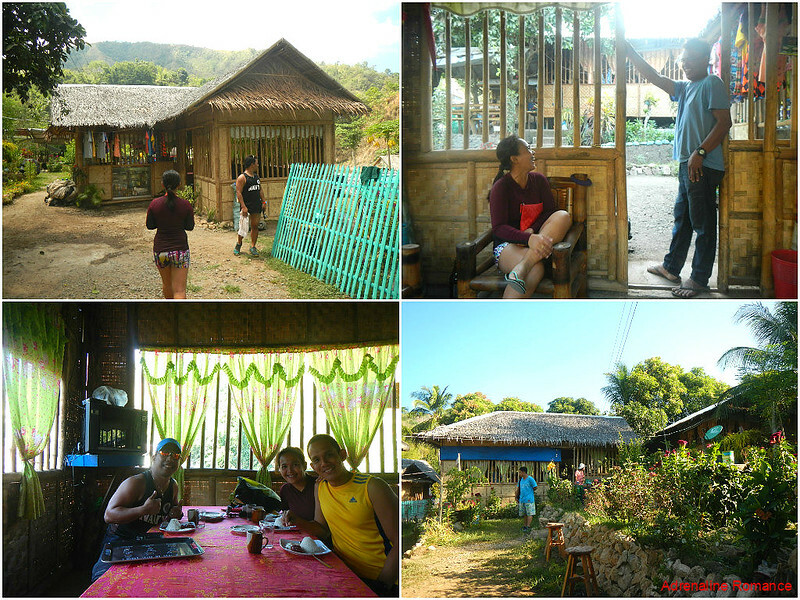 We went to the local barangay outpost to register and acquire a young female guide. 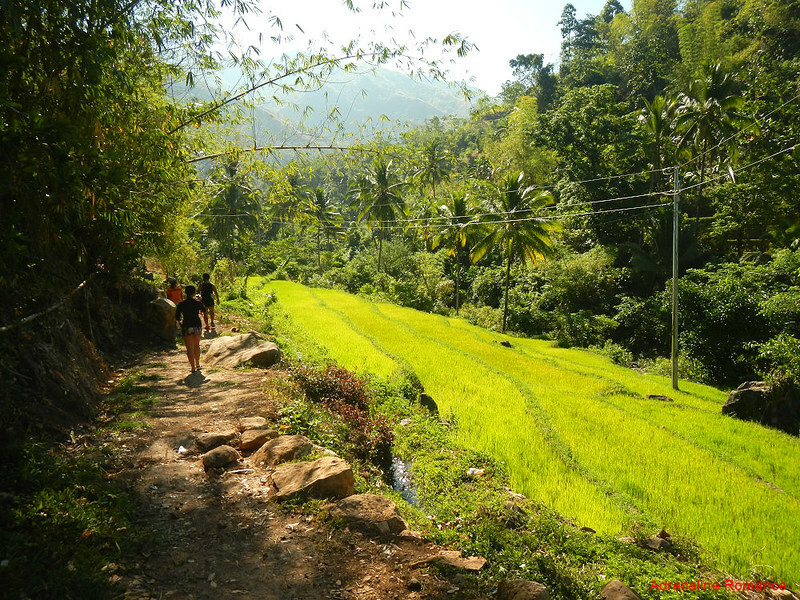 The trail to Bugtong Bato Falls waterfalls is one that local farmers frequently use. 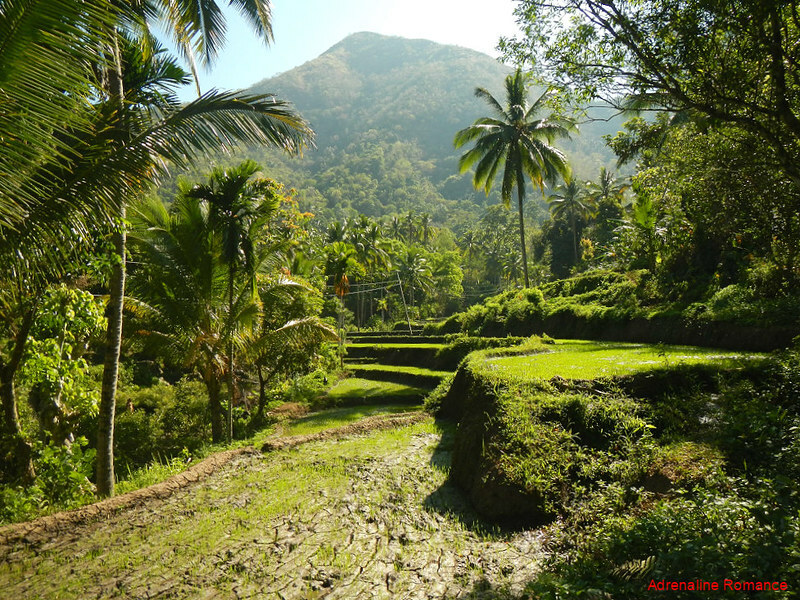 As such, it runs alongside carefully sculpted rice terraces, many of which have been freshly planted with green rice saplings. Terracing is an effective way to reduce erosion and surface run-off in farmlands. 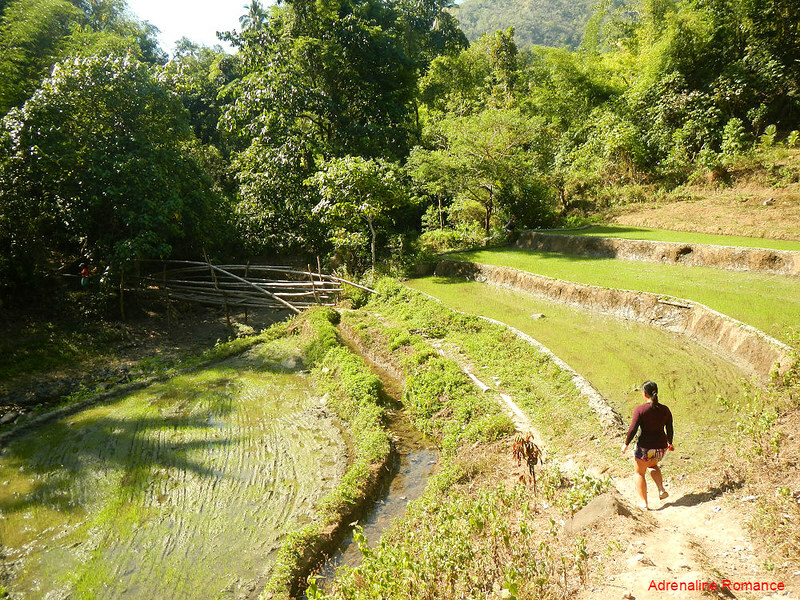 It is also an efficient way to irrigate lowland farms by allowing water to flow from mountain springs to the terraces. Check out the curved lines in the terraces. These are furrows, and they will be planted with rice. 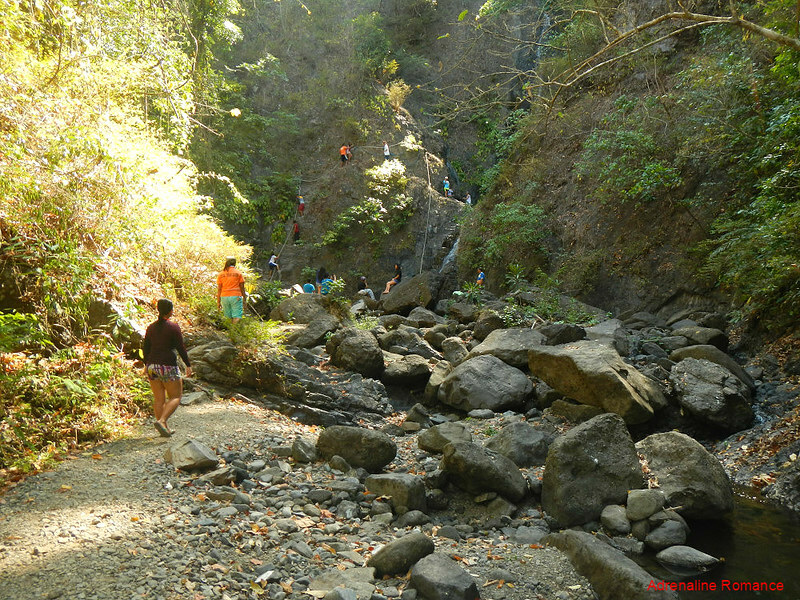 After following an easy, rocky trail, we arrived at the first tier of the Bugtong Bato Falls. With its shallow pool, it’s a great place for kids and families to cool off during summer. Due to the rather small volume of water as a result of the El Niño phenomenon, the waterfall may not look much in the photo below. But according to our guide, it becomes magnificent during rainy season. 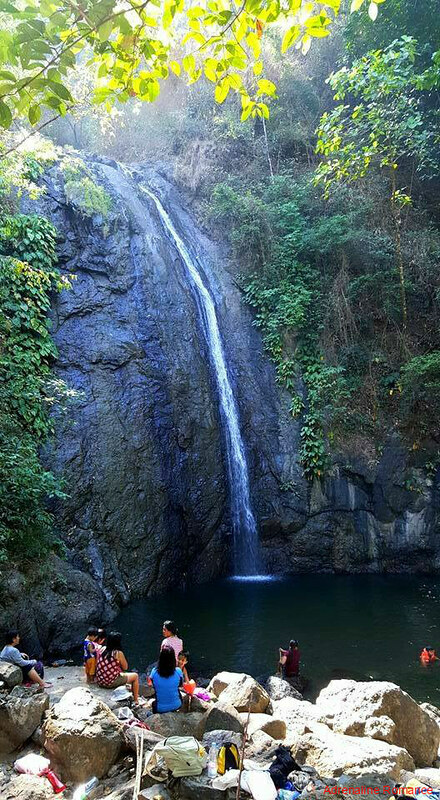 Several photos of the waterfall we found in the Internet suggest that it would look like Ulan-ulan Falls in Biliran due to the increased volume of water brought about by rain. We were supposed to rappel that slippery 60-foot waterfall as part of our river adventure. But our guide said that the equipment were removed (obviously, guideship was unavailable) due to normal wear and tear. 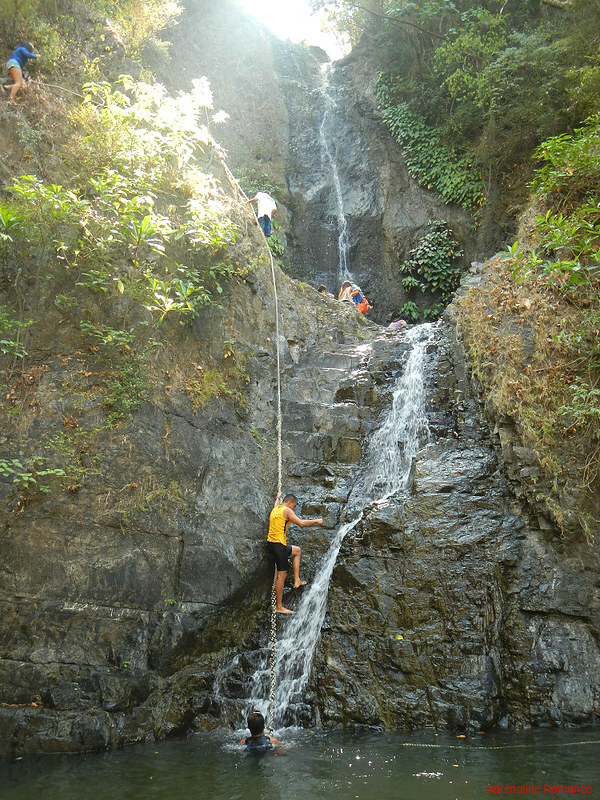 The rappelling activity will be set up after the LGU procures new equipment. 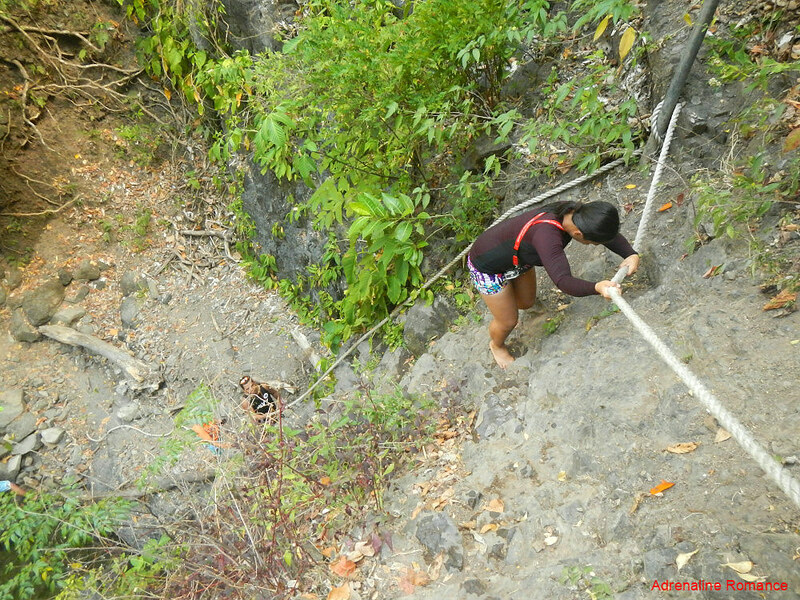 Visiting the upper tiers of Bugtong Bato Falls required climbing up this steep staircase that is fastened to the side of a cliff. Ropes are utilized as handrails for safety and convenience of the guests. Just take a look at this river’s serene beauty. Even with the growing crowd of human beings, the canyon clearly exhibited that familiar spell of wonder and tranquility that we usually feel when we visit rural and remote areas. The sound of children’s laughter as they splashed around in the waterfall also added a certain kind of magic to the place. 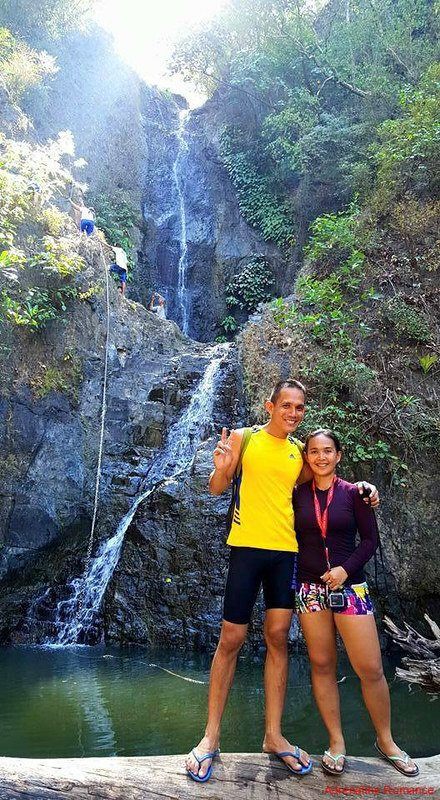 After a short trek, we were standing in front of the second and third tier of the Bugtong Bato Falls. As with the first tier, the water flowing down the rock face at the time of our visit was not impressive due to El Niño. We plan to visit here again during rainy season to see the full grandeur of the waterfalls. If there’s a rope, then there’s an avenue for adventure! At the 25-foot second waterfall, we climbed a fixed rope that leads to the third tier. It was a pretty easy climb, but we still need to be careful since the stair-like bedrock is slippery. Alternatively, there is a steep set of stairs carved into the rock at the other side of the waterfall. These stairs can be used by the not-so-adventurous folks. The third tier features a relatively deep pool that is great for shallow diving and swimming. Careful though because the sides are extremely slippery due to a light covering of moss. According to the guide, there are more waterfalls upstream. However, they are relatively far from each other and would require an entire day’s hike to cover them all. 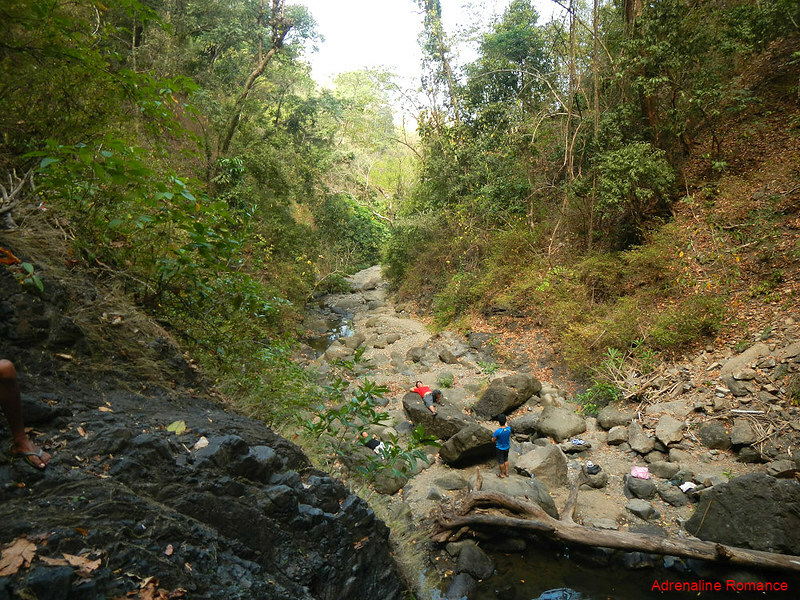 From the third level of Bugtong Bato Falls, we can see how dry the riverbed is. 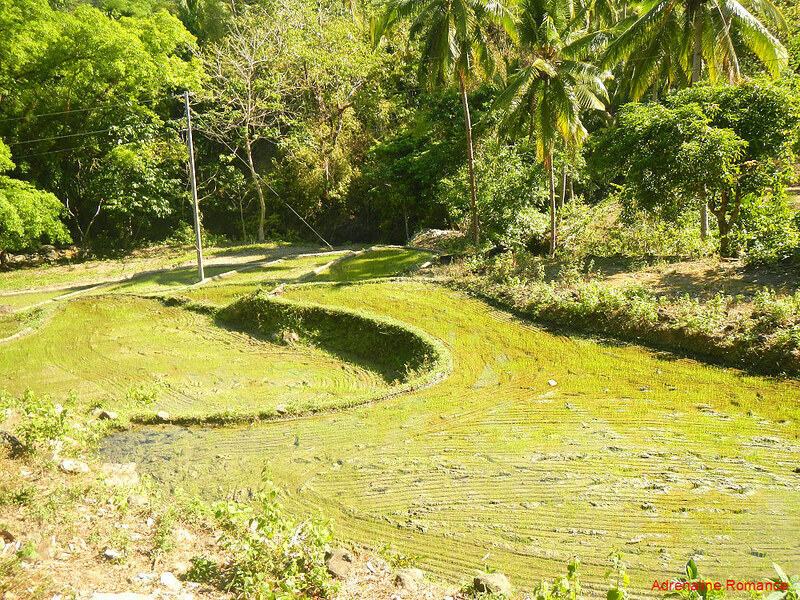 During rainy season, the volume of water increases, and this long, dry patch becomes a raging machine of Mother Nature. After having our fill of swimming, it was time to go back to Culasi to prepare for our trip home. To do so, we need to get down using a fixed rope. Be careful, the 90-degree slope is characterized by loose soil and falling rock. 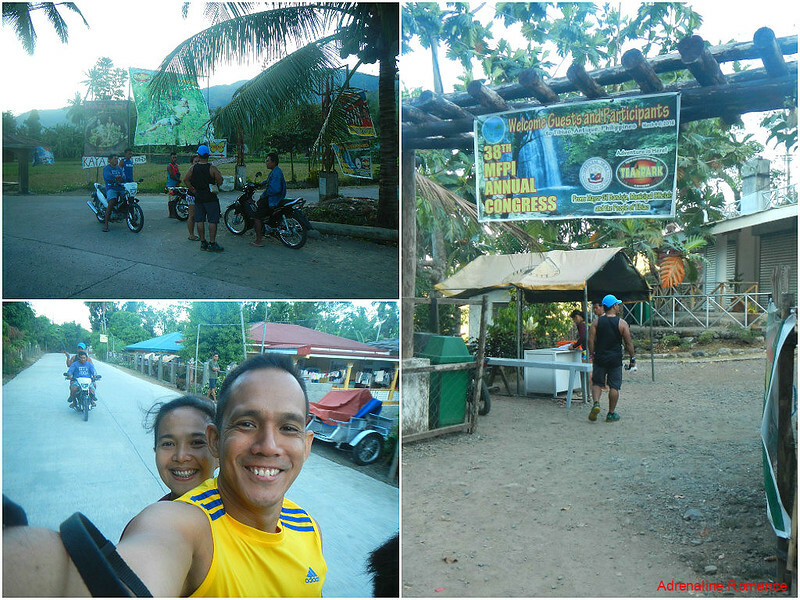 We reached the Tuno barangay town hall after a 45-minute trek. We had a light snack of crackers and softdrinks before we took a habal-habal and van ride back to Culasi. After enjoying a warm shower, we packed our stuff and checked out of our hotel. We had a filling rice-less lunch at a nearby pizza place (you should try out their spicy soup. It’s the bomb!) before we caught a bus that took us back to Kalibo. We have barely scratched the surface of Culasi and Tibiao, but it is evident that there are more adventures in this place. We will surely be back here for a planned climb up the massive Mt. Madjaas. And yes, you guessed it; side trips would be island hopping, visiting pristine beaches, heritage tours, and other adventures. Won’t you come with us? * Bakhawan related rates are published in the following post. ** We did not include our expenses for meals, snacks, souvenirs, accommodations, tips, and other fees in this rate sheet as you may have different needs, preferences, itineraries, and sharing scheme from us. Note that all figures are subject to change without prior notice. 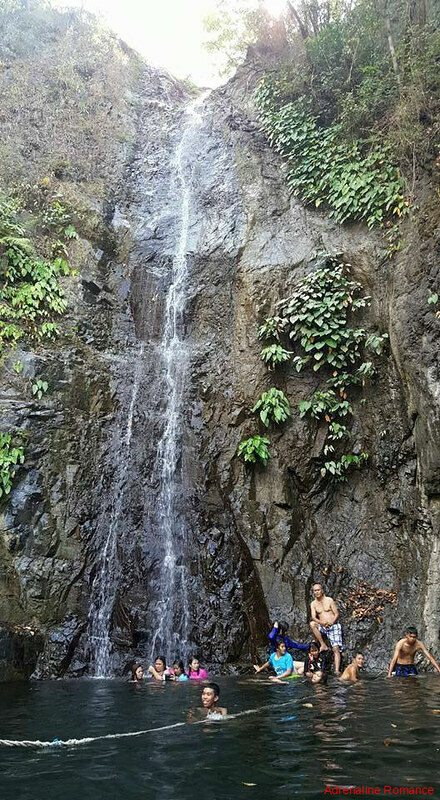 To avoid large crowds, it is best to partake the Kawa hot bath and visit the Bugtong Bato Falls early in the morning. Jeepneys, vans, and motorcycles start plying their routes early in the morning at around 5 AM. Don’t forget to register at the tourism office, which is located before entering Barangay Tuno. 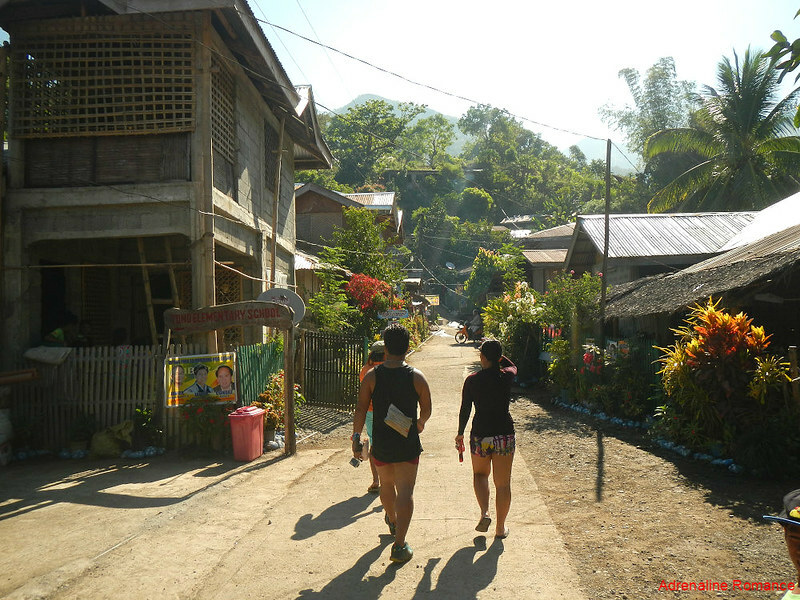 There are plenty of adventures in Barangay Tuno including kayaking, river trekking, ziplines, and more. 1. 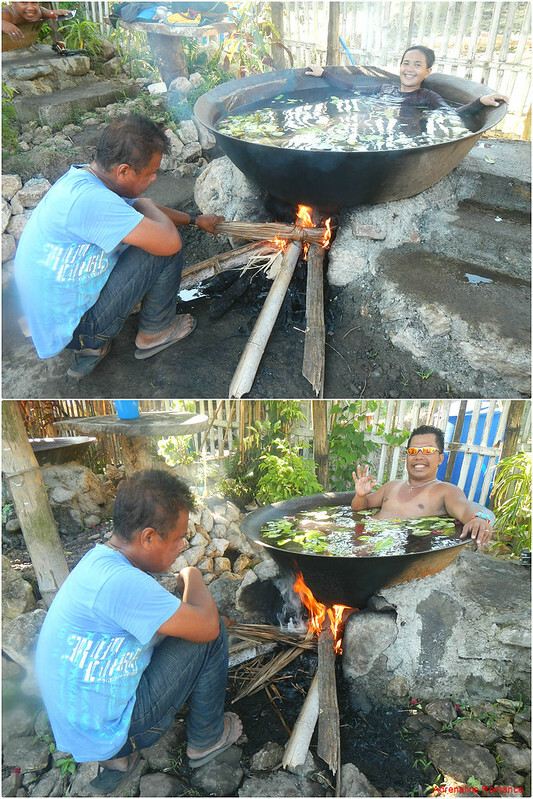 There are a lot of kawa hot bath providers in Barangay Tuno in Tibiao. Each provider has its own formula, service gimmick, rates, and more. 2. To avoid scalding yourself, enter the hot kawa slowly so your body will adjust to the heat. 3. If the water becomes lukewarm, ask the provider to rekindle the fire. 4. Don’t worry about hygiene. The water in the kawas are drained after each customer, so you are assured of dipping in clean water. 5. Relax and enjoy the experience! 1. Guides are available at the barangay outpost. 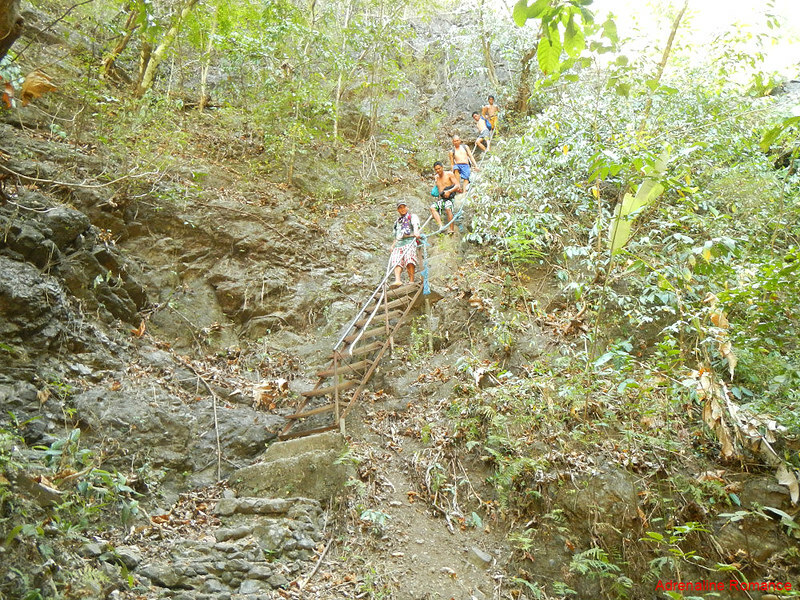 Even if it’s an easy trek, the barangay requires visitors to have a guide. 2. You will be walking on a dirt trail, so it’s best to wear sturdy trekking sandals. 3. Watch your step, and be careful when climbing or going down boulders and the steep stairs towards the second tier. 4. Use the fixed rope to carefully ascend the second tier. Alternatively, you can take the stairs at the side of the rock face. 5. Do not do any high dives! The water under the waterfalls is quite shallow in many places. 7. 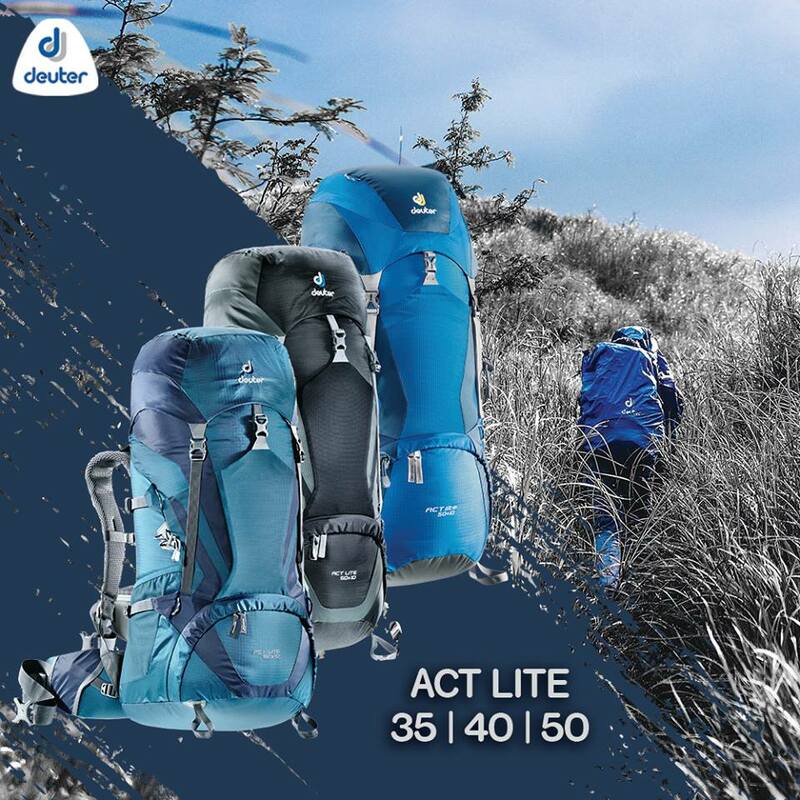 Waterproof your stuff by wrapping them in plastic bags before putting them in your backpack. 8. You can bring snacks and drinks with you. However, do not litter, and bring all your garbage with you. Do not vandalize the rocks. Wow, I didn’t recognize that there’s such thing as Kawa Hot bath. It must be an amazing experienced after your backbreaking climb to Mt. Guiting-guiting. I’m stimulated to try what you guys have experienced. Didn’t you guys feel like you were, you know, being cooked ? 😋🍲🐓. That side trip was more than a side trip – amazing feat! Haha! We could never look tinola or sinigang in the face again. Thank you. Please do visit Tibiao; it’s an amazing place. Isn’t Antique lovely? It was probably my favorite among the trips we’ve taken last year. And to think we only spent a day there. Relaxing in a kawa hot bath was indeed a uniquely local experience. It is beautiful indeed. We actually plan to go back there. We heard they have amazing dive sites. And of course, there are challenging mountains to climb there. Hehe! As in! Mahimo ka ug tinola. Hi po! Ask ko lang po kung aakyat kami ng bugtong falls may lugar ba na mapagiiwanan ng bag. Kasi gawin lang sanang daytour eh. Salamat po in advance! We are not sure. But what we did was we left our packs at the restaurant/ accommodation where we had our kawa bath. Thus, you may want to ask your kawa bath provider if you can leave your things with them. You may also ask the barangay officials if you can leave your stuff at the barangay hall. Wow! I have seen the photos on the Internet but I thought it was just a gag. This is something to look forward to. I would love to try that. Thanks!